Best list of health & safety slogans. Company, business card, poster ad slogans for hygiene, physical fitness, heart health etc. There is so much information around when it comes to health and fitness that it can be difficult to know all the facts. Here are a few health facts that may surprise you. An hours sleep could make you happier than $60,000. Cash machines are as dirty as public toilets. Coffee can help ward off depression. 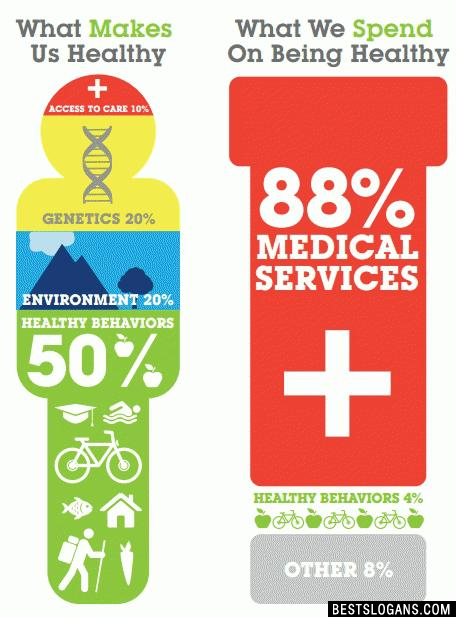 What does it mean to be healthy? Is it a number on the scale, blood pressure score, jeans size, a body free of disease, or something else? Health can be a touchy subject. We fight over what it should look like (Dove ad or Victoria's Secret model). We fight over what size dress is healthy (16, 8, or 2). 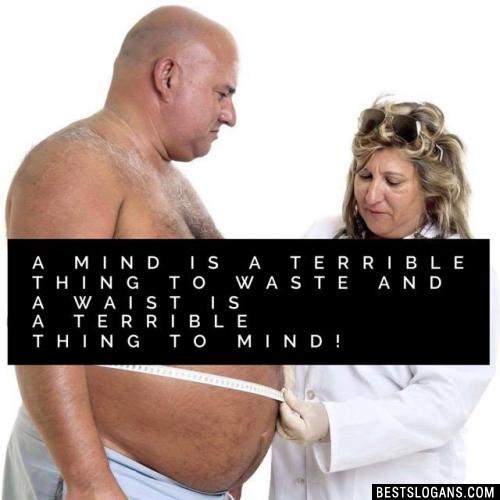 We bash and judge all who don't fit into our ideal. We forgot to factor in the most important ingredient. What does it feel like to be healthy? What does that look like? Living healthy involves a mix of physical, mental, and emotional components that make us who we are. We literally create our bodies from the inside out with what we put in, what we think, and what we do. Regardless of what we think picture-pefect health looks like, there is one thing we all have in common when it comes to health: Everyone wants to feel better. 2 Two Servings A Day Keeps Bone Problems At Bay. 3 Have You Ever Wondered Why Cows Are So Healthy? 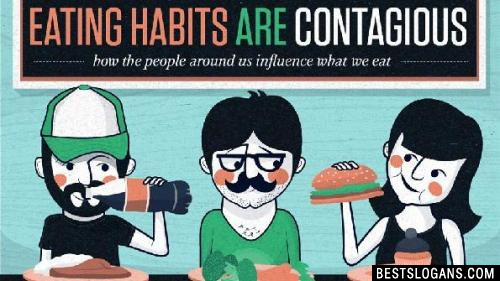 Random thought: Be well aware of those around you and their healthy eating habits as it can play a role in influencing how you eat as well. 4 Beef: It's what's rotting in your colon. 5 Be clean! Be healthy! Birthdays are good for your health. 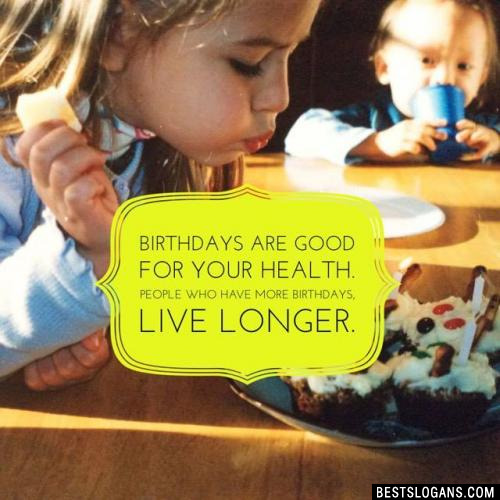 People who have more birthdays, live longer. 7 The easiest way to get a healthy body is to marry one. 8 In order to change we must be sick and tired of being sick and tired. 9 If you don't take care of your body, where are you going to live? 11 Prevention is better than cure. 12 Just because you're not sick doesnt mean you're healthy. 15 Don't starve your health in pursuit of wealth. It's your future. 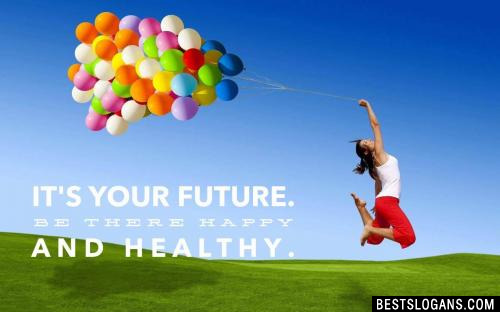 Be there happy and healthy. 17 See you in your healthy-self. 18 Healthy is the new "Happy"
20 The greatest wealth is health. 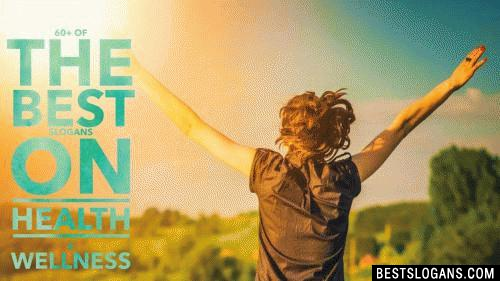 Can you think of a good Health Slogans we're missing? Or come up with a clever one of your own. Please share below.